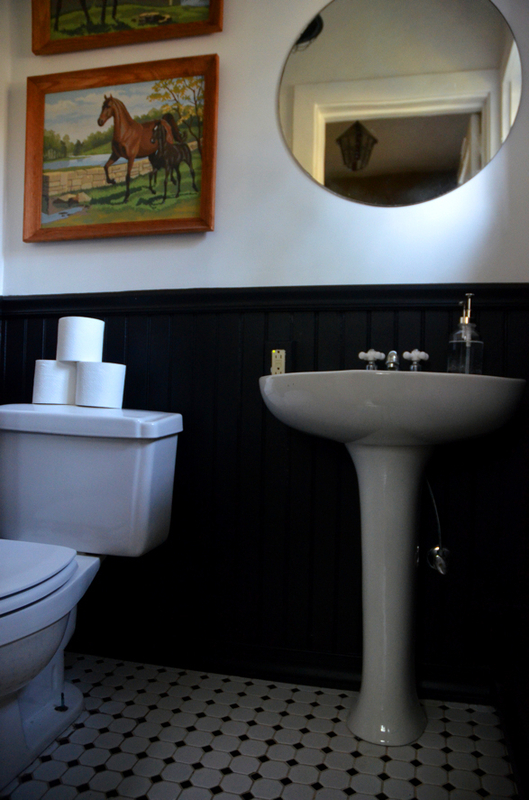 I'm so excited to show our little makeover we did on our tiny little half bath! When we first came through the house this room had a swan border, and the wainscoting was just plain dirty. Also the toilet seat was slightly scary looking, not too inviting for guests to be using! I'm really happy we were able to give this a quick little makeover and I am so happy with how it came out! This little bathroom isn't original to the house, but I was really glad they went with simple black and white tile for the floor. The first time I saw it it just screamed to me to go black and white all over! I also couldn't believe the adorble little window was completely covered up by a curtain. In order for someone to see into the bathroom from outside they'd need to put a lader right up to the side of the house, so I knew it was safe to totally ditch any sort of curtains. When I told my mom I was going to paint the wainscotting black, I think she was a little nervous. It is a little dramatic in theory, but I think it ended up looking really classic. It's nice too because I can always switch out the art, or hand towels and accessories in the future to change things up if I want and it's no big deal. Lets just talk for a second about my of my absolute favorite part of the bathroom now, this adorable light! I'm kind of obsessed. The bathroom didn't even have a working light before, so not only is it great to be able to, you know, use the bathroom at night, but this one is so gorgeous! The super sweet people at Lamps.com sent me it, and I knew it would be perfect for this little space. I've been pretty obsessed with industrial style lights for a while, and I love the balanace of vintage and industrial in it, and it isn't overwhelming for this space, which worried me with a lot of other lights. I also really love having something that's a little more unique, and not just the same-old ikea or home-depot lights, it feels just a little more special. We also would love to find a fun Edison Blulb or something for it, but we love how it looks with just a plain bulb too. I get a little giddy looking at it each time I go in the bathroom! Me and Frank stopped in my favorite local antique store to search for a mirror. It turned out the perfect one was hanging out in there just waiting for us! I love old mirrors. Some people might be turned off by the little knicks and imperfections, but I like to think of it as a little character. Of course, while we were in there I fell in love with these horse paint-by-numbers! I know vintage paint-by-numbers are kind of a trendy now, but I had never really given them much thought until I saw these! Of course, they're horses, so I think that might be the biggest draw for me. I think they're exactly what this little space needed too - a little bit of color and fun to balanace out all the stark contrasts. Of course, now seeing one room done I can't wait to get to work on the rest of the house. There's plenty of nessasary things we need to do before any of the other rooms get painted or anything. Important things like, you know, re-wiring, converting the heating system (just to gas! Don't worry, the radiators aren't going anywhere:), and lots and lots of spackling. We'll get there eventually though!